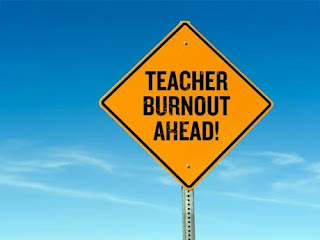 It’s May and you may be experiencing “Burn Out”, what do you do now? It is too late to consider what you could have done to prevent burn out in the first place. What do you do? You are exhausted. Your energy level is low and it is apparent because everyone says that you look terrible. You have pushed your professional clothing to the back of your closet and thought about wearing those Saturday sweats on casual Friday. Your tolerance for having to repeat your classroom expectations and your patience with the little noises and frequent giggles is gone and you have resulted to referrals to the office. Every single day you think about calling in sick because you know you need a mental health day. There are a lot of things that you can do to make sure that you don’t crash and burn during those last few weeks of school. Below is a list of things that I do to endure until the end of the school year. 1. Do not do the infamous countdown to the last day of school! That makes the days much longer. Instead try planning some fun activities for your students that they can look forward to for the closing of school. 2. Surround yourself with positive people. Stay away from the colleagues that complain about their job (adopt this practice year around). If there are no positive people around, then lose yourself in a good book. 3. Grab your fitness watch and take a walk with a peer during lunch or your prep time. 4. Plan a vacation. By planning a vacation, you give yourself something to look forward to and anticipation can be major motivation. Even a planned Stay-cation is effective. Plan to explore your local areas. 5. Buy or make your colleagues some snack packs. They are experiencing the same problems that you are right now. Chocolate is the cure for the midday blues on any day. Your co-workers will appreciate it and they may return the favor when you need it. 6. Take a day off of work and rest. If it will help you to better serve your students, just take a day. May is a long month and depending on when your spring break was given you may have had more than two months straight without a long weekend. Take a day. Your students will thank you for it (they need a break from you too). 7. Plan something fun for your students. Don’t result to movies and shallow lesson plans, do that cross-curricular unit that you wanted to do for your students all year long. They will love it (just make sure that it is well planned). 8. Get a mid-day massage during your prep. Just cover your windows and call your favorite masseuse if your administration will allow it. If you can’t have visitors, put on some soothing music get out your favorite lotion or oil and rub your own feet and legs. 9. Maximize your weekends with a fun but relaxing activity that you can enjoy either alone or with your family. Take a scenic drive and just breathe. Go for a walk in nature’s glory. Don’t let four walls hold you. 10. Reflect. Spend some time thinking about ways that you have been effective and how you may have to change for the next school year. Try writing in a journal and make it a routine that you can revisit regularly. Many well-adapted people journal. That’s it. Take care of yourself. See you next year.